I wasn't lying when I said I'd be more prudent in the whole documenting the belly process. I'm actually about done with my 30th week, but am behind with the posts. 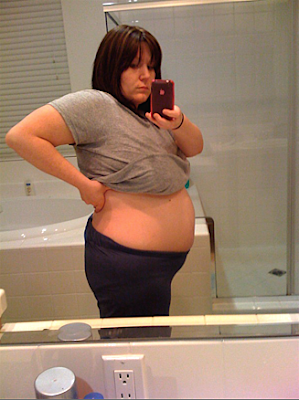 This is me at 28 weeks, and yes, the belly is HUGE. It's not huge in the stick straight out sort of way, but rotund is a great descriptor in this case. I am definitely showing a lot more this go-around. Mom literature on the subject says this is quite normal with subsequent pregnancies. I know one thing, Baby G likes to move, especially while I'm on deadline at work. I just told Brock I needed to see baby G belly. Now I am content, but I still want to see the owner of the baby G belly live and in person.. hint, hint. I can't believe you are 30 weeks!